Joining the circus may not be an option, but here’s the next best thing: Neowiz Entertainment's Circus Marcus for the iPhone and iPod Touch. In Circus Marcus, you'll follow the lead character as he performs increasingly difficult circus stunts (from handstands to elephant stacking) in an attempt to catch the eye of his ladylove, Ruby the Ringmaster. Circus performer or Bruce Lee in a track suit? You decide. You are Marcus, a janitor with a dream—to be a top circus performer (oh, and, to get the girl). You must work your way through four stages of five mini-games, most of which make big use of the accelerometer and touch screen. 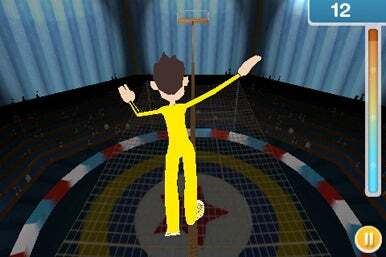 The mini-games include handstands (tilt to balance), tightrope walking (tilt to balance), human canon bowling (aim and shoot with the touchscreen), flying trapeze (swipe to perform tricks), and “Ele-Vator” (tilt to catch things and stack them up). The games are all pretty different and entertaining, though I found the flying trapeze to be a bit difficult with the touchscreen. There are also three “unlockable” modes, which include unlimited flying trapeze and Ele-Vator, as well as “Pin-Sanity,” which features nine different layouts for human canon bowling. The game is quite entertaining—at least for a little while. After an hour or so, though, you realize that you’re just playing the same five mini-games over…and over…and over. Also, the loading time between each level is incredibly long (upwards of five seconds), and I found the game crashed more than a couple of times during my first hour of play. The graphics are cute, though choppy, and the game makes good use of the accelerometer and touchscreen. However, there aren’t really enough mini-games to make this worth more than a few minutes of your time—I was getting bored just fifteen minutes in. Also, the crashing and loading time is unacceptable. But as a free app, it might be worth a few minutes of circus-filled escapism.